At Habitat for Humanity, we’re lucky to witness new beginnings in our work all the time. We celebrate a fresh start whenever we plant shovels in the earth at the Groundbreaking of a new site. We look with hope and optimism to a renewed future at every Home Dedication. We see children race through newly-built bedrooms as their parents clutch their house keys for the first time. We’re also lucky enough to celebrate completions. We honored to celebrate Russell Johnson, who recently finished paying the mortgage on his Habitat home. 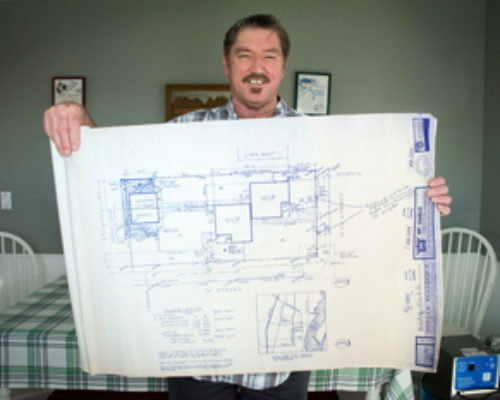 Russ purchased his Antioch home in early 1997, a major achievement for the single father of four. Before Habitat, Russ had struggled to support his four children – whom he was raising on his own – while working as a school bus driver. He and the kids lived in a rental that had fallen into disrepair and termite infestation, at the mercy of an unreliable landlord. Habitat brought stability, opportunity, and a sense of permanence – a hand up to a father who wanted to give his children solid ground. And although it’s the end of something, it’s also a beginning. His mortgage payments behind him, Russ is now retired, and he uses much of his spare time to travel. He also volunteers, giving back to Habitat at special events by providing entertainment for children. His home also sees new beginnings, as it’s still the center of family gatherings, taking “lots of abuse” as well as hosting new memories from eight grandchildren. For Russ, the completion of his mortgage is a landmark on a journey that continues forward. The journeys that begin with Groundbreakings and Home Dedications – and culminate in mortgage completions – are only possible because of our community of support. The generosity of our supporters transforms lives.